the last day of the trip proper. 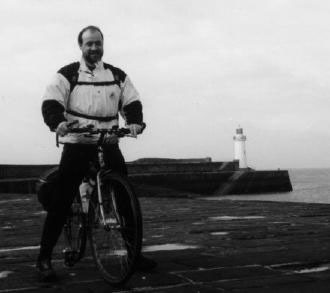 heading down to whitehaven, and then on to cleator moor, on the first part of the c2c, where my brother-in-law farms. we abandoned the official route via cockermouth to travel down the coast, one of my favourite rides. for those who wish to stay official, try the old crown inn at hesket newmarket, where they brew their own beer, it's well worth a visit. we bade our farewells and set off for kirkbride and then silloth. the land is fairly flat and so the going is easy. or it would have been had the wind not been up and against us. i can't have sacrificed enough pulses to flatula, the godess of wind. at skinburness we called in to the skinburness hotel for a cup of coffee & some buscuits. we were the only people in the lounge, and it all felt rather grand. 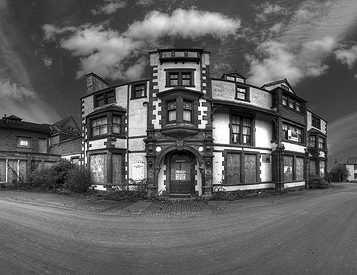 update - this building now derelict, but was a super old place that managed to retain much of its charm. we continued on to silloth where we stopped to purchase some silloth shrimps, in order to bribe family into letting us sleep in the house and not the barn. poor old silloth. had the victorians got their sums right, port carlisle would have been a major port, and silloth would have shared the prosperity enjoyed by resorts like blackpool. instead the port didn't quite work, the viaduct accross the estury fell over, and silloth remained a small backwater seaside town. the shrimps are yummy though. the going was quite tough, but the scenery was marvellous - dunes & sea. we stopped at allonby to stock up on fruit & vegetables, but failed miserably, and bought choccy & sweets instead. and then onwards. we finally reached whitehaven and spent a while trying top find the place to get stamped on. its at the southern end of the harbour. then i dipped my wheel in the sea, as is the custom. the start of the c2c is not too bad, once you're out of the bustle & confusion of whitehaven town centre. the disused railway track is metalled and, if you can avoid the broken glass & other general rubble, makes for good cycling. my sister lives about 30 seconds from the c2c track, which was handy. we spent a jolly fine evening there. good food, good drink, good company. a fitting end to the trip.